May God bless you and your family with a happy Thanksgiving. Martha and I are gearing up for most of our family to be present with us today. Our daughters, their husbands, and our four grandchildren will be with us for most of the day. We have fun–and exhausting–activities planned for the afternoon. We are also blessed to have Martha’s sister with us and her son from Birmingham. We are thrilled about all of this. Thanksgiving is not simply a holiday. It’s the most thoroughly Christian celebration. Giving thanks naturally points us to the One who is greater than we are. While we love the worship emphasis, we also love the tangible benefits we get from being thankful. Studies about thanksgiving have been abundant in recent years. All of them show the value of being thankful and having an attitude of gratitude. We simply do better in almost everything when we have a grateful heart. Just yesterday, I read that pastors who are thankful and grateful do better and are more satisfied than those who aren’t. Did they have to do a study to know that? We are all better people when we recognize that we are blessed. It is particularly meaningful when we give all glory to God and praise His name. May you and yours be blessed today! When the Ark of the Covenant came to Jerusalem, King David appointed Asaph and his brothers to sing thanksgiving to God. Those words (1 Chronicles 16:8-13) would be meaningful for us today. “O give thanks to the Lord, call on his name, make known his deeds among the peoples! Sing to him, sing praise to him, tell of all his wonderful works! Would you like to receive all of my posts? It’s quick and easy process by signing up below or at the top of the page. Happy Thanksgiving Dr. Bailey!!! May God continue to Bless you, your family and the work you do for the kingdom!!!! I’m thankful for many things and you and Martha and your family are right up near the top. thank you for bring us closer to Christ. You are a wonderful example of God’s love at work. Happy Thanksgiving to you and your family from the Crow’s in Arizona. We really miss your messages. You are very kind. 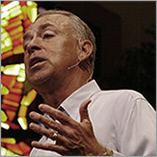 Have you looked at the podcasts or the live streaming on FBC website?